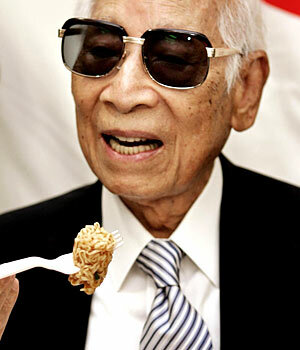 Today would have been the 102nd birthday of Momofuku Ando, the man who gave us instant ramen and Cup Noodles. He died five years ago, but if I had one, I’d be raising my Giant Curry Cup Noodle to him for having made noodles the global food that we know them to be. Taiwanese-Japanese (all good things come in multinational packets), he started noodle company Nissin when he was nearly 50, using a secondhand noodle machine and a wok after losing pretty much everything in his previous business ventures. Inspired by sights of people patiently queuing in the cold for bowls of ramen during the food shortages in Japan following the second world war, he started trying to figure out a way to make noodles cheap, tasty and easy to make. The result was Chikin Ramen (チキンラーメン), a cellophane pack of noodles pre-fried in palm oil where the flavor was locked into the noodles themselves, needing a quick bath in hot water and they were ready to go. You can’t go to a Japanese supermarket without seeing the orange-and-white branding to this day and it has been endlessly copied ever since. Ando suggested that the use of chicken was key – Muslims and Jews don’t eat pork (the usual base for a ramen broth), Hindus don’t eat beef, but ain’t no religion that won’t kill a chicken. A while later, with his noodles becoming popular around the world, he saw how Americans would break the noodles into a cup to eat them, rather than a bowl. The Cup Noodle was born – the food that now pretty much defines the instant meal – pour over water and go. And it beats a sandwich pretty much every time. Worldwide variations include Bolognese (Brazil), mashed potato (Germany) and Mast Masala (India). One of Ando’s weirder sayings was ‘mankind is noodlekind’. In his own screwball way, he had a point. He helped in the democratising and globalising of the noodle, to the point where starving students and posh pensioners happily slurp the same stuff, from Japan to America and all the places in between. Simple and cheap but also pretty edible – the instant noodle transcends food snobbery and different cultures to be the fast food that it’s OK to like. Ando was said to have eaten instant ramen every day – crediting it for the longevity that took him to his last noodle-y day at the ripe old age of 96. When he died, Nissin was selling about $3 billion of wheaty goodness every year but the bigger dream for Ando had been what he finally accomplished in 2005 when Soichi Noguchi became the first man to eat instant ramen in space. Ando’s funeral at the Osaka Kyocera Dome in 2007 was a paean to the realisation of this dream – it was space-themed. His story is one about starting, failing, starting, failing, starting, failing and then finally making a success of it. So happy birthday Ando-san- I hope they have kimchi flavour in space.